Seasonality appears to be a major driver of speciation, particularly in plant-eating insects that specialize on hosts that are only available during limited seasonal windows. The apple maggot fly, Rhagoletis pomonella, provides a textbook example, historically feeding on native hawthorns in North America but now shifting to exploit apples, an introduced crop. 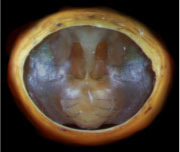 Apples fruit earlier, the flies have only one generation per year, and the apple host race has evolved earlier seasonal timing via changes in pupal diapause regulation. Regions of high genomic divergence correspond with regions that respond to selection on seasonality (Only Chr. I,II,III shown). From Egan et al. 2015, Ecol. Letters. 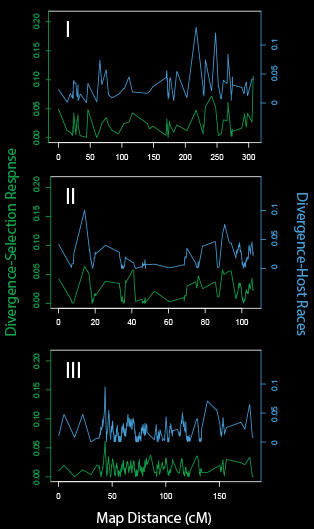 We have found a striking correspondence between genomic divergence between host races and genomic regions that respond to artificial selection on seasonality. The specific targets of selection appear to be several developmental regulatory events related to diapause overwintering and the timing of adult emergence. We are applying studies of developmental series of endocrine sensitivity and gene expression in combination with Genome Wide Association Studies (GWAS) to disentangle these targets of selection and determine whether they evolve as constrained or independent modules.